My favourite season is Autumn. Partly because the foliage is beautiful, but mostly because of the constant wind and rain storms that make staying inside seem so cozy. Today, July was pretending to be a part of Autumn with cooler than average temperatures all down the East coast, and torrential rain for the greater part of the day. I woke up and was immediately thrilled by the dark sky and the distant rumbling of thunder. 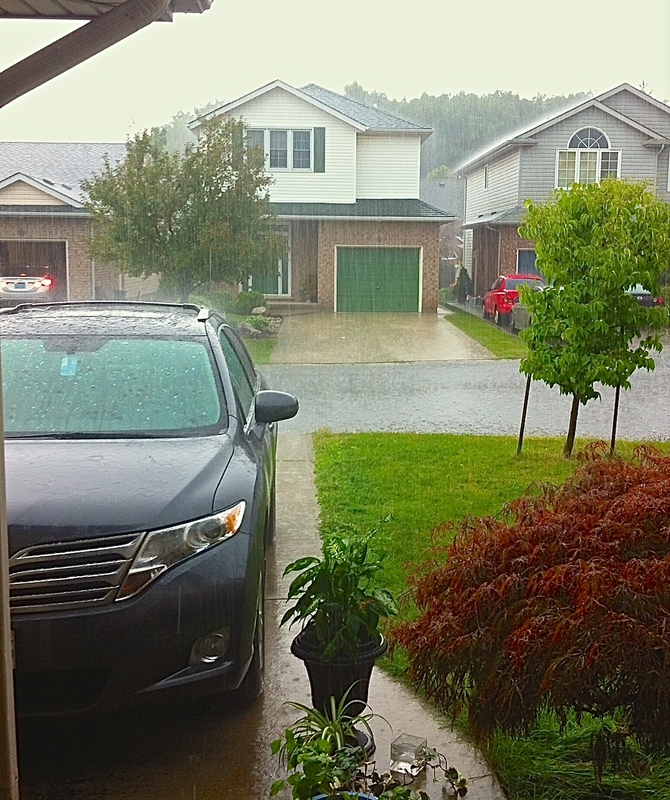 With all the windows open in the house, the rain and thunder made its presence known. I obviously didn’t mind. After all, I had a comfy old T-shirt on, a warm cup of tea, and The Mindy Project playing on my laptop. With the rain pouring down, I wouldn’t be needed at work, so I was free to fill my mind (and my day) with nothing but Netflix and a little laundry. Suffice to say, the lawn won’t be watered for the next week. Eventually, I decided I should be an adult and actually shower and change out of my pyjamas so I headed down to the basement to check on the laundry. That’s when I saw it. Water. Everywhere. The sump pump had failed us and the basement had flooded (again). I carefully walked over the wet tiles into the carpeted room, welcomed by water pooling over my feet with every step I took. My lazy day parade had literally been rained on. I mopped up the floor and haphazardly piled various belongings from the floor to the side table and dresser of the room, in an attempt to organize the soggy destruction. I was irritated beyond belief. This was supposed to be my day! I was supposed to be relaxing and taking naps, lulled to sleep by the sound of rain hitting my window! Instead I was splashing around indoor puddles, and not in a fun way. It’s as if the sky had said “Cry me a river,” and proceeded to demonstrate just how to do it. While cleaning up I realized in a not-so-optimistic way that after the rain there isn’t always a rainbow. Sometimes there’s just puddles.